Finding the Subject of Sentences. 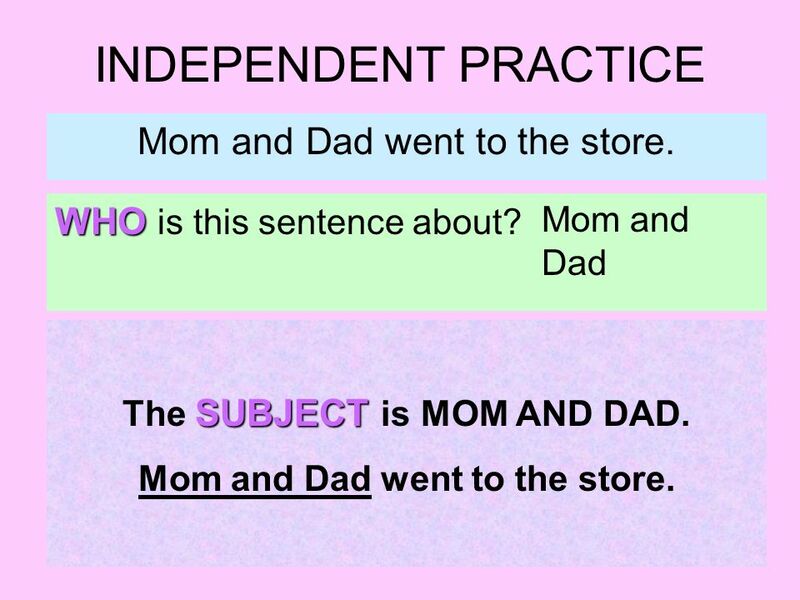 What is the SUBJECT of a sentence? SUBJECT The SUBJECT is the naming part. It tells you WHO the sentence is about. 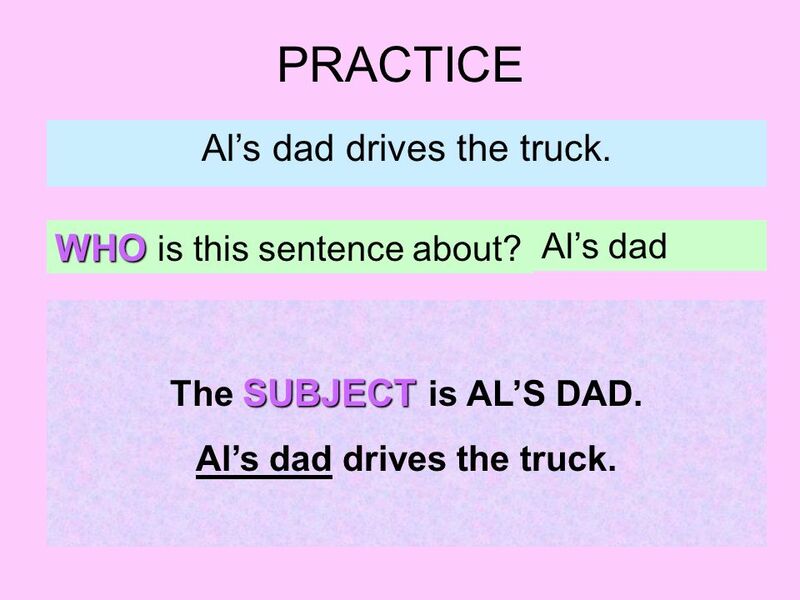 2 What is the SUBJECT of a sentence? SUBJECT The SUBJECT is the naming part. It tells you WHO the sentence is about. 3 How do I find the subject? 1. SUBJECT When you read the sentence, ask yourself WHO is this sentence about?. 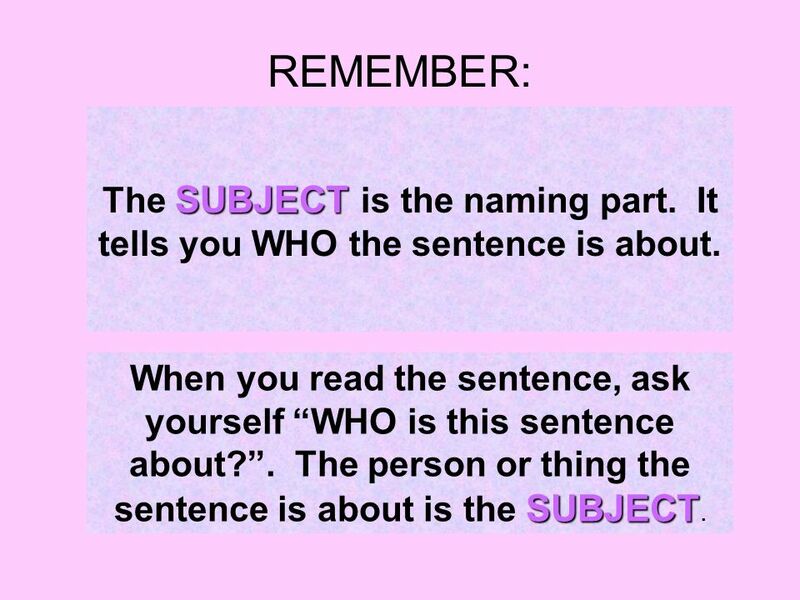 The person or thing the sentence is about is the SUBJECT. 2. SUBJECT Look for the action word. 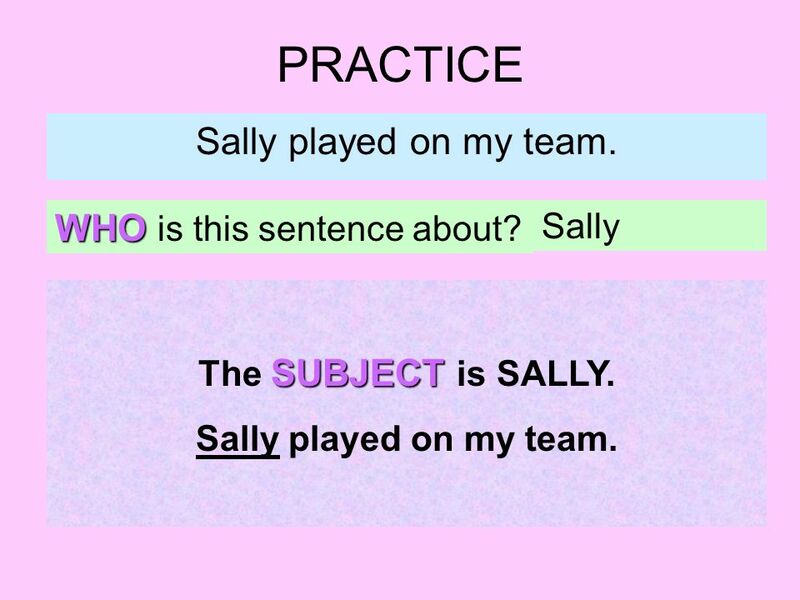 Usually, the words in front of the action words in a telling sentence are the SUBJECT. 4 EXAMPLE The dog chased the mailman. WHO is this sentence about? THE DOG SUBJECT The SUBJECT is THE DOG. The dog chased the mailman. 5 PRACTICE Als dad drives the truck. WHO is this sentence about? Als dad SUBJECT The SUBJECT is ALS DAD. Als dad drives the truck. 6 PRACTICE Al makes a big splash. WHO is this sentence about? Al SUBJECT The SUBJECT is AL. Al makes a big splash. 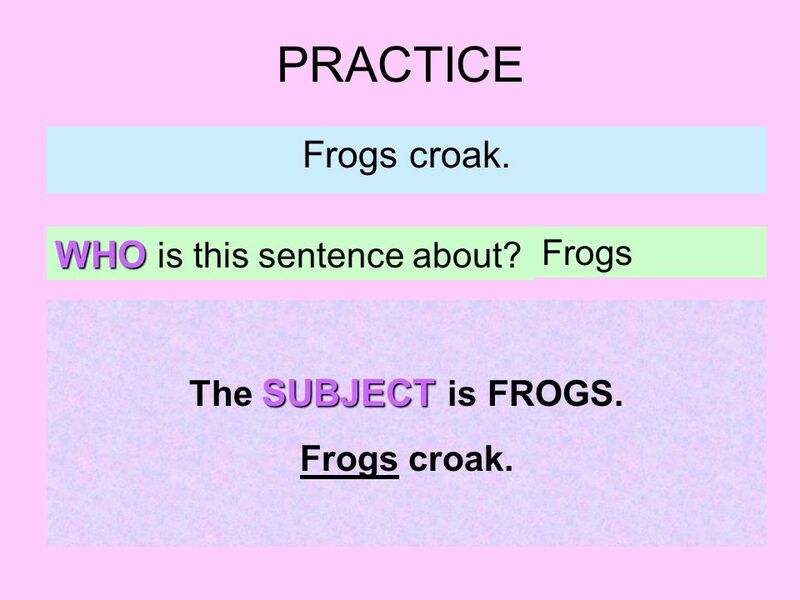 7 PRACTICE Frogs croak. WHO is this sentence about? Frogs SUBJECT The SUBJECT is FROGS. Frogs croak. 8 PRACTICE He grabs his things. WHO is this sentence about? He SUBJECT The SUBJECT is HE. He grabs his things. 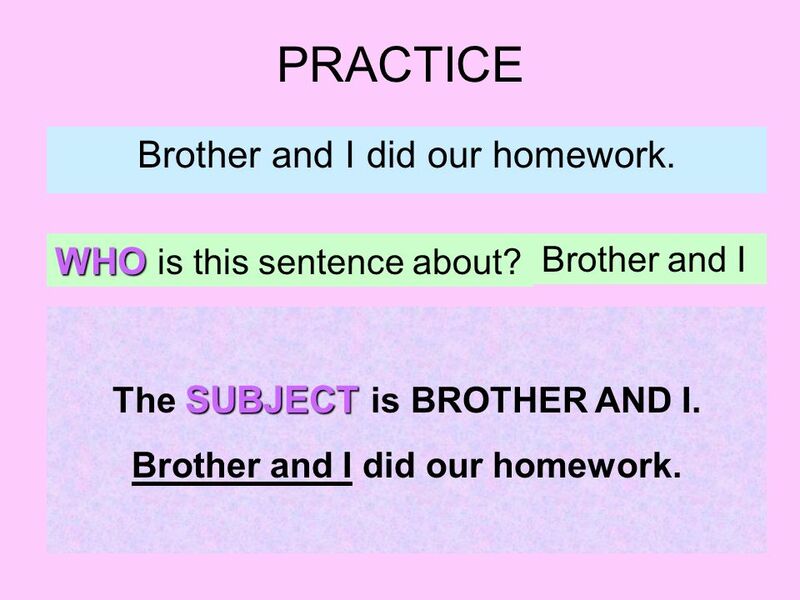 9 PRACTICE Brother and I did our homework. WHO is this sentence about? Brother and I SUBJECT The SUBJECT is BROTHER AND I. Brother and I did our homework. 10 PRACTICE Sally played on my team. WHO is this sentence about? Sally SUBJECT The SUBJECT is SALLY. Sally played on my team. 11 PRACTICE Kelly and Bess painted a picture. WHO is this sentence about? Kelly and Bess SUBJECT The SUBJECT is KELLY AND BESS. Kelly and Bess painted a picture. 12 PRACTICE My mother and her friend had a party. WHO is this sentence about? My mother and her friend SUBJECT The SUBJECT is MY MOTHER AND HER FRIEND. My mother and her friend had a party. 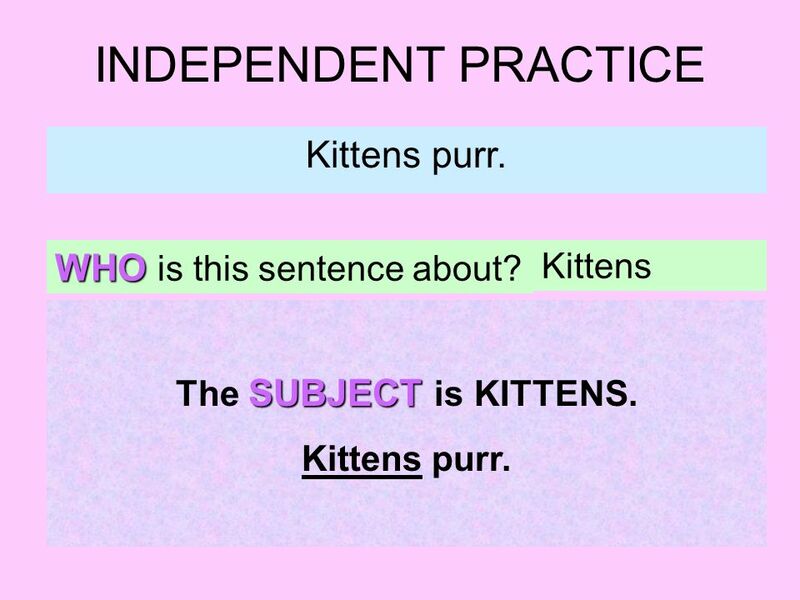 14 INDEPENDENT PRACTICE Kittens purr. WHO is this sentence about? Kittens SUBJECT The SUBJECT is KITTENS. Kittens purr. 15 INDEPENDENT PRACTICE Mom and Dad went to the store. WHO is this sentence about? Mom and Dad SUBJECT The SUBJECT is MOM AND DAD. Mom and Dad went to the store. 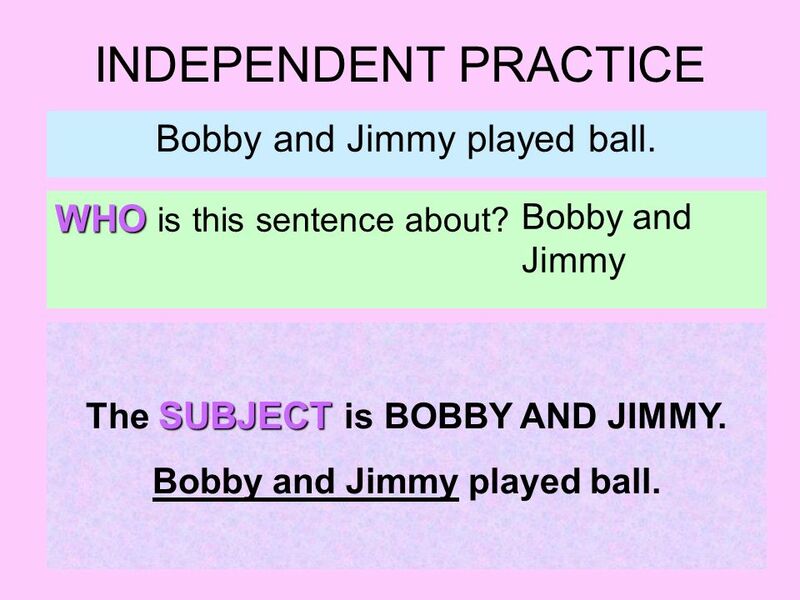 16 INDEPENDENT PRACTICE Bobby and Jimmy played ball. WHO is this sentence about? Bobby and Jimmy SUBJECT The SUBJECT is BOBBY AND JIMMY. Bobby and Jimmy played ball. 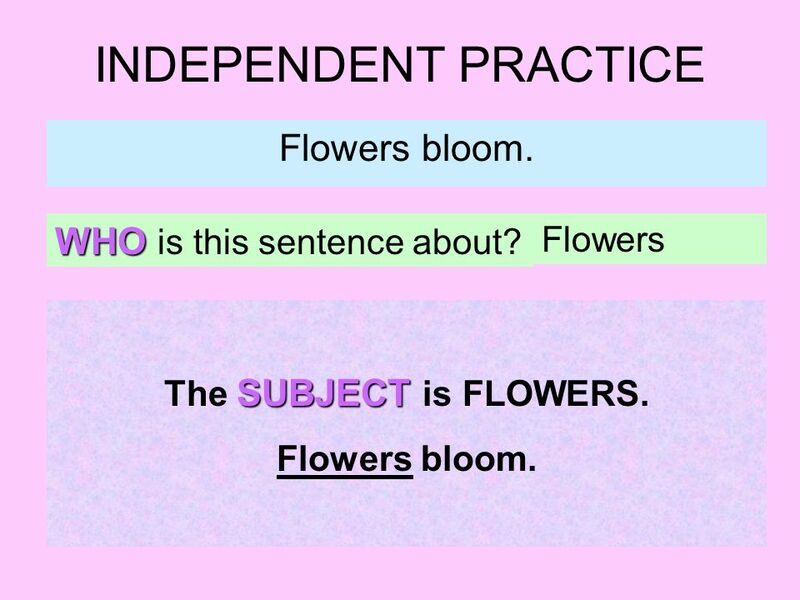 17 INDEPENDENT PRACTICE Flowers bloom. WHO is this sentence about? Flowers SUBJECT The SUBJECT is FLOWERS. Flowers bloom. 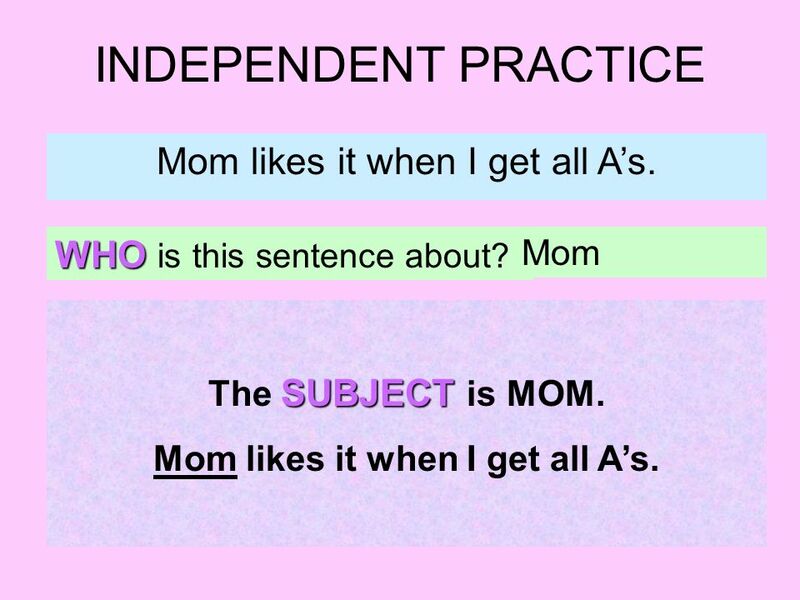 18 INDEPENDENT PRACTICE Mom likes it when I get all As. WHO is this sentence about? Mom SUBJECT The SUBJECT is MOM. Mom likes it when I get all As. 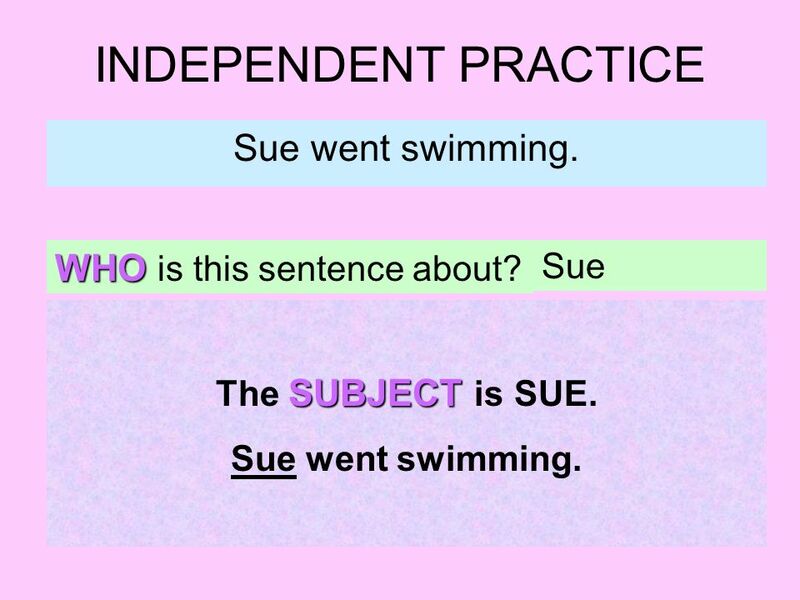 19 INDEPENDENT PRACTICE Sue went swimming. WHO is this sentence about? Sue SUBJECT The SUBJECT is SUE. Sue went swimming. 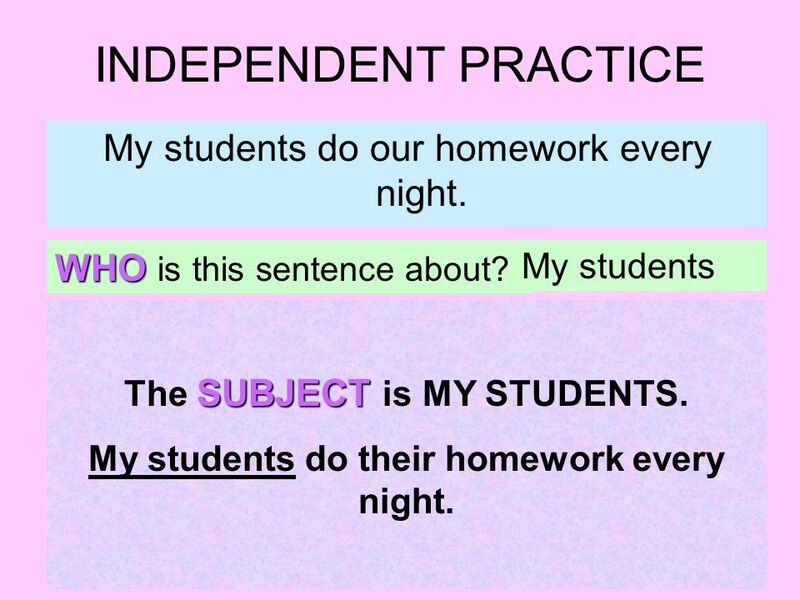 20 INDEPENDENT PRACTICE My students do our homework every night. WHO is this sentence about? My students SUBJECT The SUBJECT is MY STUDENTS. My students do their homework every night. 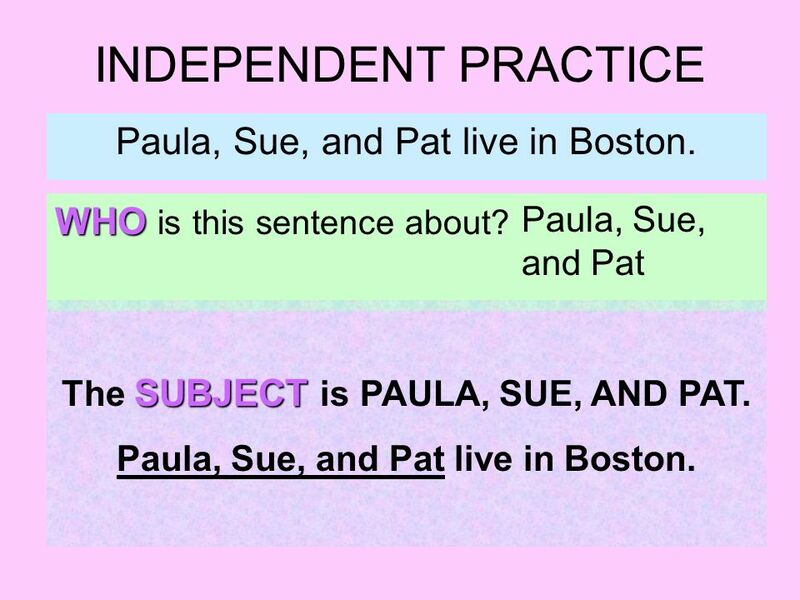 21 INDEPENDENT PRACTICE Paula, Sue, and Pat live in Boston. WHO is this sentence about? Paula, Sue, and Pat SUBJECT The SUBJECT is PAULA, SUE, AND PAT. Paula, Sue, and Pat live in Boston. 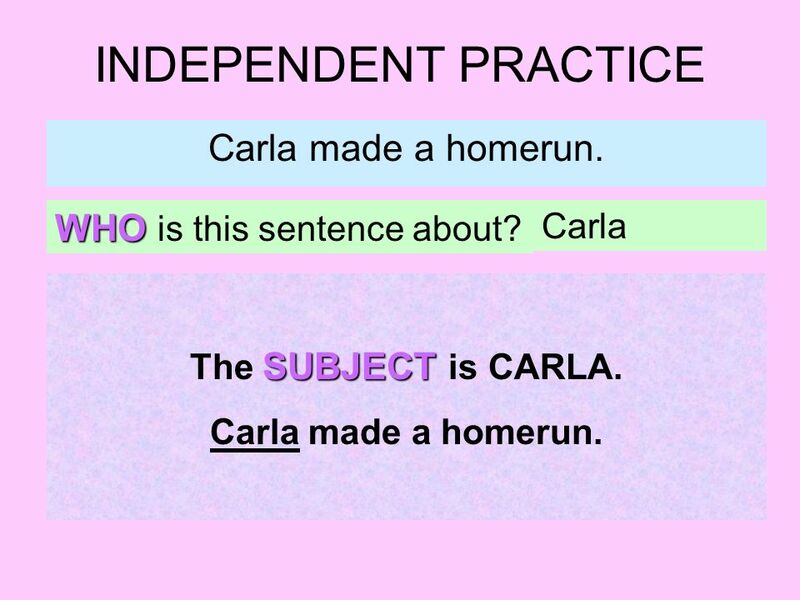 22 INDEPENDENT PRACTICE Carla made a homerun. WHO is this sentence about? Carla SUBJECT The SUBJECT is CARLA. Carla made a homerun. 23 INDEPENDENT PRACTICE Uncle Joe plays ball with Sam and me. WHO is this sentence about? Uncle Joe SUBJECT The SUBJECT is UNCLE JOE. Uncle Joe plays ball with Sam and me. 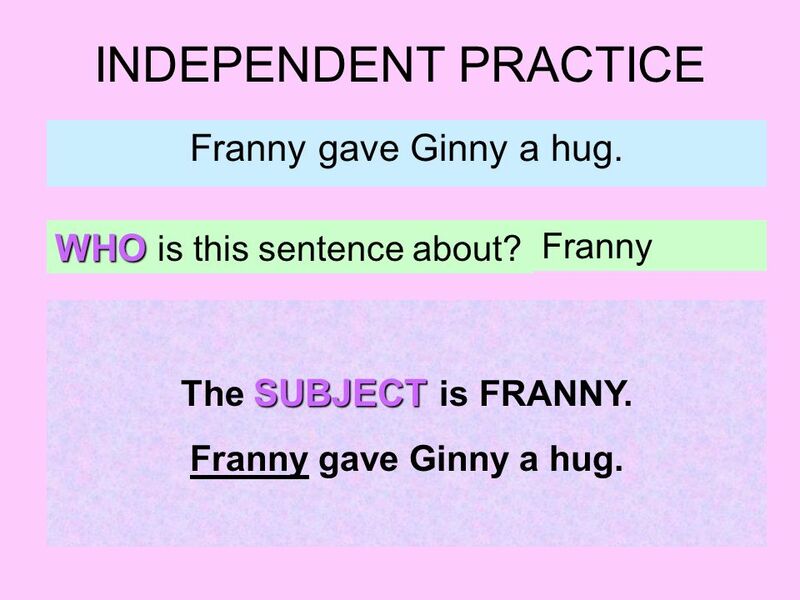 24 INDEPENDENT PRACTICE Franny gave Ginny a hug. WHO is this sentence about? Franny SUBJECT The SUBJECT is FRANNY. Franny gave Ginny a hug. 25 REMEMBER: SUBJECT The SUBJECT is the naming part. It tells you WHO the sentence is about. SUBJECT When you read the sentence, ask yourself WHO is this sentence about?. The person or thing the sentence is about is the SUBJECT. 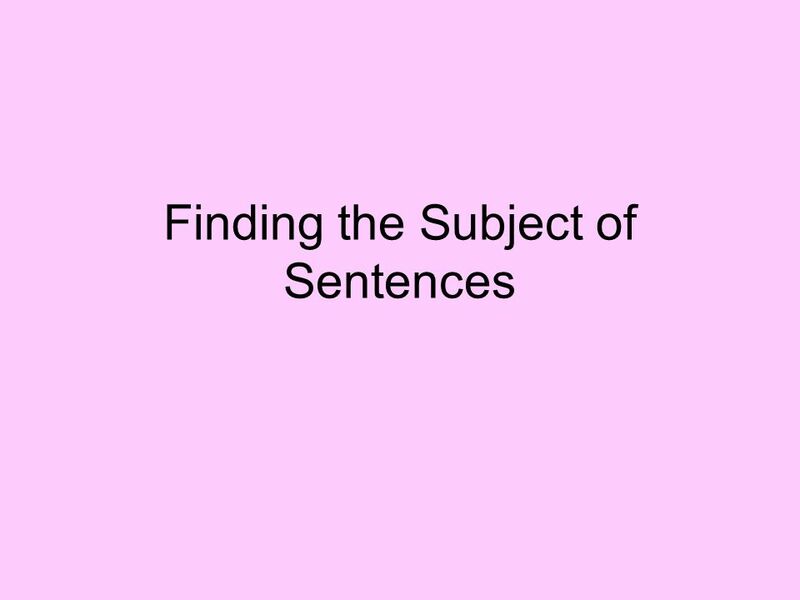 Download ppt "Finding the Subject of Sentences. 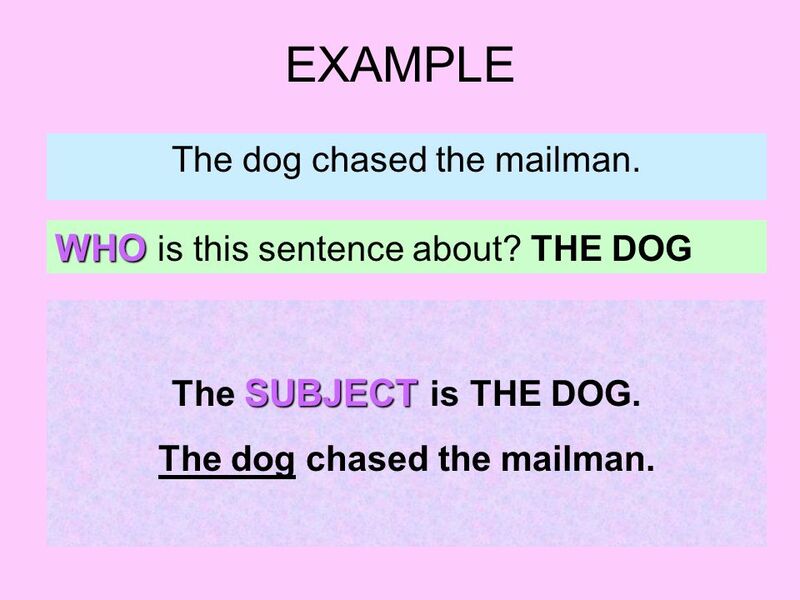 What is the SUBJECT of a sentence? SUBJECT The SUBJECT is the naming part. It tells you WHO the sentence is about." Name It! What is a noun? A noun is a person, place, thing, or idea. Person: cowboy Place: church Thing: beachball Idea: justice. Enter quietly and… Get a Project sheet and a piece of white paper from the front bookcase Get a Project sheet and a piece of white paper from the front. 3rd Grade. Let me tell you a story about the naughty boy. Pronouns We and Us Andrea White 2 nd Grade Pronouns take the place of nouns. 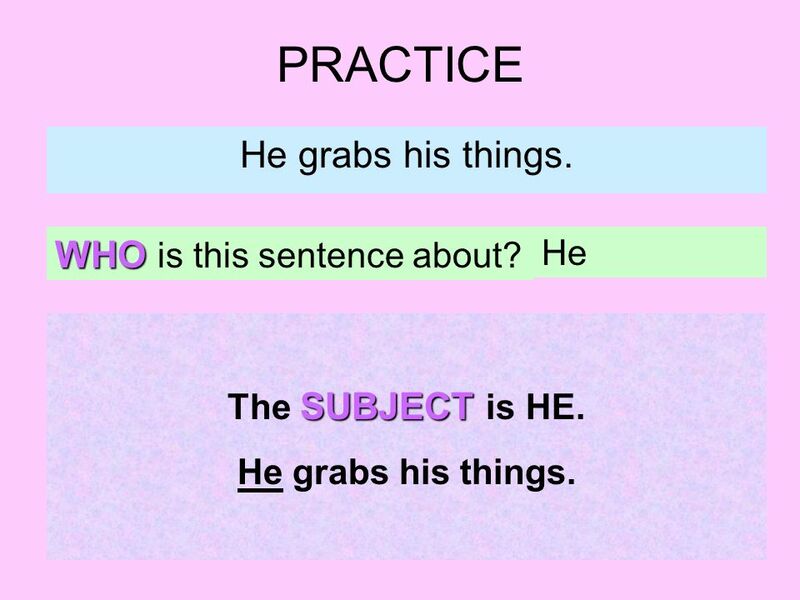 Use the pronouns we and us to tell about yourself and another person. We. It Really Is Who You Know. S O C I A L N E T W O R K I N G How did Joe get his job? 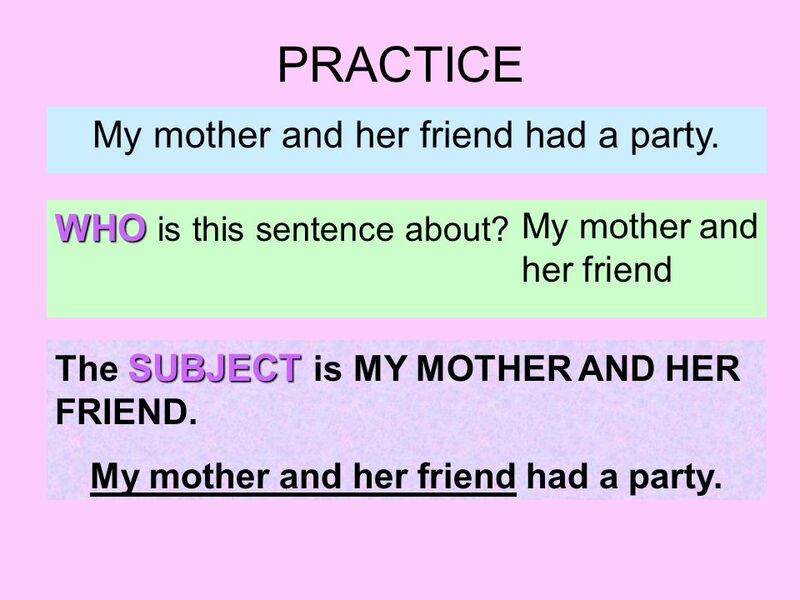 Complete and Incomplete Sentences Reteach Mrs. Caro. Weeks 11 and 12. 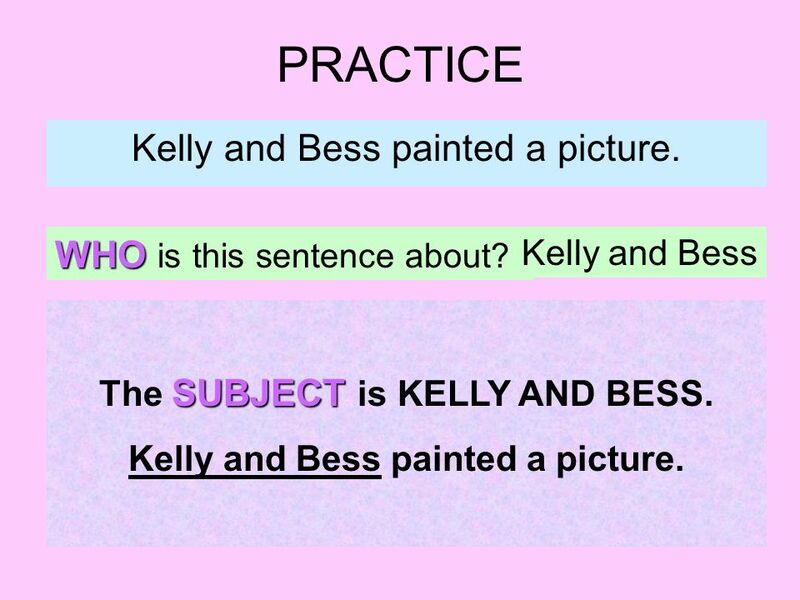 Complete Sentences Every sentence has a subject and a predicate. 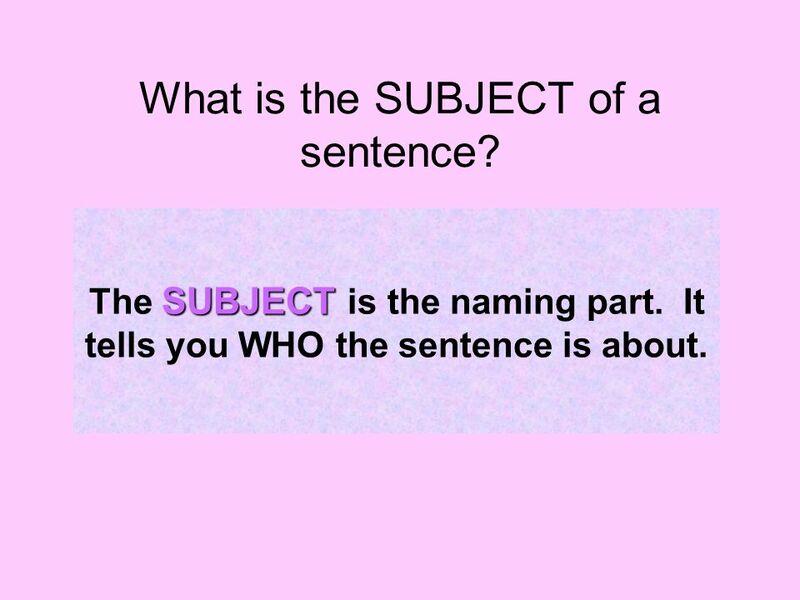 The subject is ______ or what a sentence is about. The predicate is. Fluency Phrases. at the store his dog to my house. First Grade Library Skills Lesson Restates/retells and asks questions about the topic, problem or question with guidance. Subject/Predicate. Subject Every sentence has 2 parts Every sentence has 2 parts The subject The subject The predicate The predicate  The subject of. 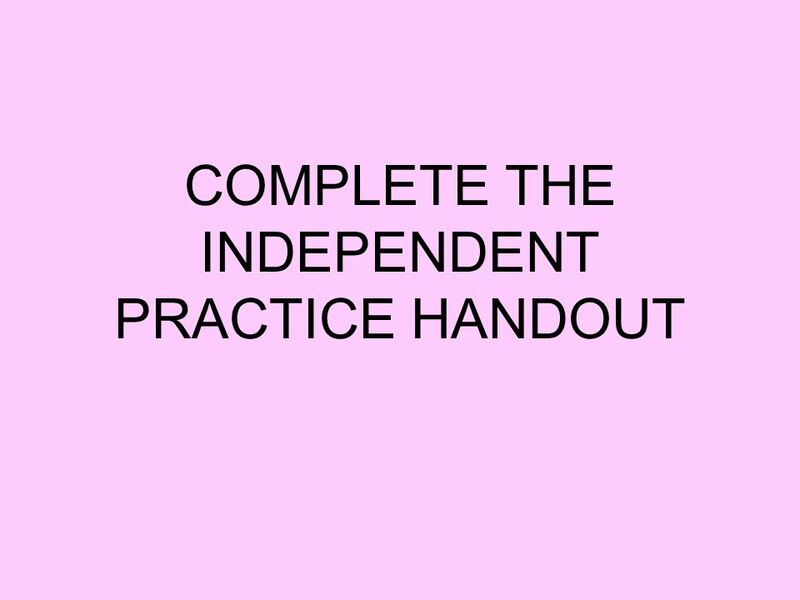 Think Pair Share Break this sentence apart into the subject and predicate. Mr. Nuno’s wife had a baby boy. Mr. Nuno’s wife had a baby boy. 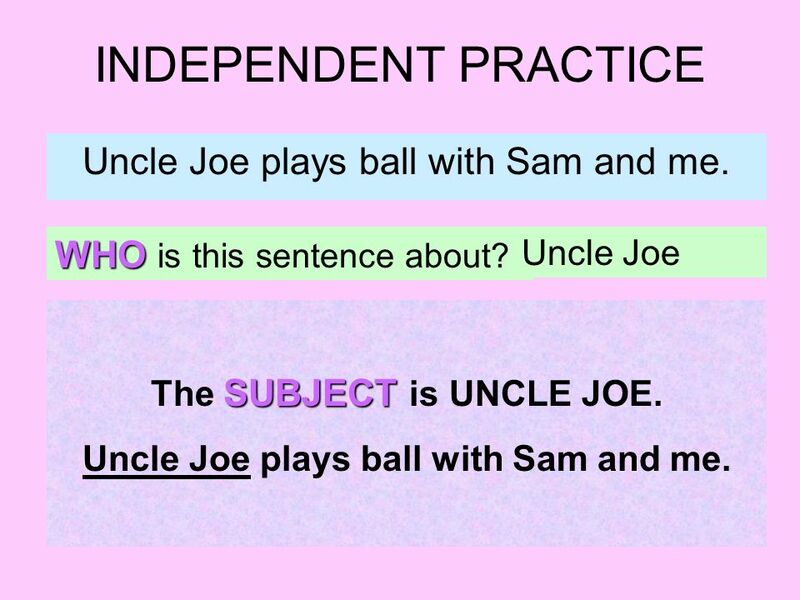 T ODAY WE WILL IDENTIFY SIMPLE AND COMPOUND SENTENCES. Dialogue Punctuating Game © 2013 Jessica Osborne, “ ” ? !. POINT OF VIEW. What is point of view? What is point of view? A. a place where you can view things A. a place where you can view things B. the position. Subject & Nouns Complete & Simple Subjects Developed by Amy Thornton Dyer School. Subject and Predicates Project LA Activity. Every complete sentence contains two parts: a subject and a predicate. 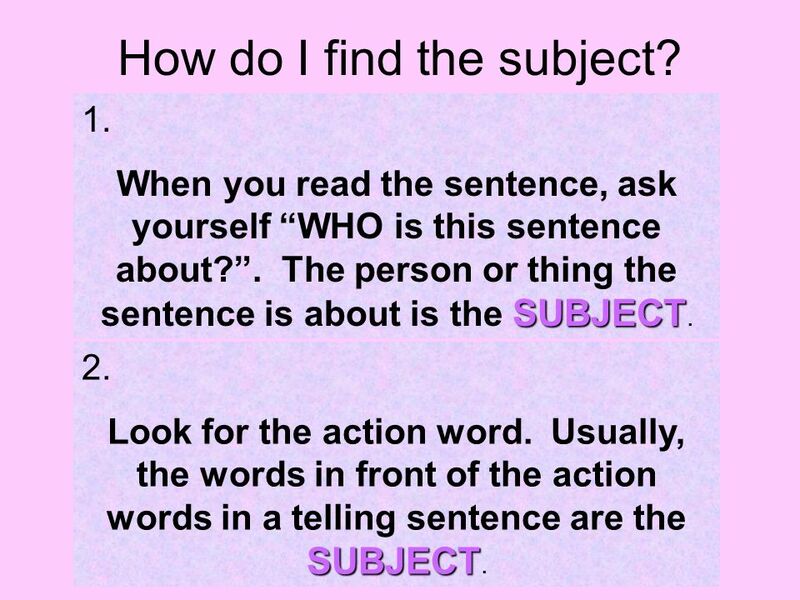 The subject is who or what the sentence.